With historic charm and atmosphere, combined with modern convenience. You no longer have to settle for stereotypical hotel rooms for your stay in Kingston, Ontario, Canada. Set in its own grounds this Bed & Breakfast Inn presents a relaxed atmosphere in a restored country home, providing modern convenience in an atmosphere of culinary delight and luxury. We are located on the world renowned Rideau Heritage Route (the east side of Kingston), close to Fort Henry, where the majestic Rideau Canal and the St. Lawrence River meet Lake Ontario – Gateway to the beautiful 1000 Islands. Breakfast is always a special occasion at Green Wood Inn, Bed and Breakfast. We take great pride in providing our guests with a stay and culinary experience we trust they will cherish and remember with delight. Over the years, we have been able to perfect the dishes we prepare, adapting as we go to accommodate fresh and local produce wherever possible. We usually alternate between savoury and sweet to provide our guests with the best variety possible. Of course juice, fresh ground coffee and a selection of loose leaf teas is served with breakfast. Given sufficient notice, most dietary concerns can be accommodated. Please take a moment to visit our rooms and rates page. You can then phone, email or make your reservation on line. Reasons to come stay, stay longer and return again and again…. As one of Kingston’s finest ‘Historic Inns’ (‘Listed’ historic property, originally built C 1850) Green Woods Inn, Bed and Breakfast, is located on the east side of the city providing easy access to Kingston, the 1000 Islands of the magnificent St. Lawrence River. Within easy reach of Historic Old Fort Henry, Canada’s Royal Military College Rideau canal and Prince Edward County. With downtown located just five minute away we provide a spectacular entrance to Kingston. Offering amazing views of Kingston as you cross the LaSalle causeway from the east to the west side of the Great Cataraqui River. Queen’s University is just a few minutes away. We are conveniently positioned 2km. south off Highway 401 (exit 623), – ideal for those visiting Kingston and also for the 401 traveller. All in all we are the perfect central location to discover Kingston and surrounding area! June 2016: A group of 6 ladies arrived at Greenwoods Inn this past week for a 2 night stay. Nigel and Tessa are the ultimate hosts and very caring individuals. The Inn is restored beautifully, the gardens are coming into their full bloom. It is a 10 -15 minute drive to centre of Kingston. Breakfast was gourmet and bountiful with both Nigel and Tessa sharing the honours. There is a lovely lounge with a coffee Tassimo to make Tea and Coffee. April 2016: My wife and I recently had the pleasure of staying here overnight. We are from Kingston, but decided to spend the night at a local B&B to celebrate our tenth anniversary. I checked us in on Saturday afternoon. Nigel and Tessa were very friendly and welcoming. The house itself is gorgeously restored to late it’s 19th century glory. After dinner at a downtown restaurant, we retired to the Green Woods Inn for the evening. As it was early April, we were the only guests, and we enjoyed a very quiet, rare evening without our kids. Breakfast the next morning was a genuine pleasure. The joint effort of Nigel and Tessa in the kitchen resulted in, without a doubt, the most delicious breakfast either of us have ever enjoyed. The pleasant conversation we enjoyed with our hosts for the next hour or so made for a very relaxing Sunday morning before returning to the real world. 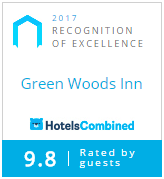 I would recommend the Green Woods Inn to anyone looking for a place to stay in Kingston. It is just off the highway and only a few minutes from the heart of the city.March 2016: I wanted so much for my son and daughter-in-law to make this trip but their loss was certainly my gain. I did not realize that I was so exhausted and run down. The drive from Toronto was pleasurable, sunny and bright and I could feel the stress leaving my body with each km I drove. Spending time with my friend of 17 years was amazing; no kids, no grand kids. What made it even better was how easy it was to get to Green Woods Inn. As they say “right off the highway.” When you walk in the door and receive the glad greetings from Nigel and Tessa you know this is your home for the time being and you know that it will be marvelous. Very helpful hosts; directed us to the best locations to visit in downtown shopping area and a great evening out for dinner. Breakfast, what can I say. Nigel outdid himself with the cooking and Tessa continued to be sure that we were comfortable and happy. Who could ask for anything more. The drive home was peaceful but full of non stop talk about how much fun we had. Feb 2016: Situated minutes off 401 on hwy #15, great location for travellers. About a 12 minute drive to Queens University. We were in town to watch an OUA Mens volleyball game ( to see our son). Lots to see and do in Kingston! Our room, appointed entirely of antiques was reminiscent of sleeping over at Grandmas, only queen bed with comfy mattress and pillow top, and lovely crisp sheets was MUCH better, simply dreamy. Our hosts gave us a very warm welcome and made our Valentines stay extra special (red rose and chocolates in our room). The breakfast was first class! Fresh orange juice, homemade croissants and preserves. Our beautiful fruit plate featured banane flambé. Main course was bacon bruschetta and frittata with fresh basil and tomato. We finished every bite sipping coffee and chatting with another couple at family style breakfast. A real treat! Thank you Tessa and Nigel, we will be back to sample more of your sumptuous breakfasts!! Sept 2015. We just came home from a 4-night stay at Green Woods Inn. We met wonderful people, had a very comfortable 2-bed ensuite room, and had a different gourmet breakfast each day! Lovely gardens, several different places in & out to sit and relax, and altogether a great place to call home for a few days. Located in a residential neighbourhood, there is easy access by car to both the city and the highway. Would highly recommend this to anyone and hope to get back again! One of the best hotels in Kingston, ‘Five star ‘all the way, Staying in a Bed and Breakfast Kingston this is one of the very best. The breakfast is amazing, breakfast to die for! Looking for amazing accommodation in Kingston, look no further this bed and breakfast Kingston is ‘top draw’ all the way. Breakfast was beyond words, simply amazing magic coming from the kitchen…….